If you see one Christmas-themed theatrical event this year, let it be All is Calm. Unlike most Christmas shows, there is not a red and green banner, brightly wrapped present, or figgy pudding in sight. It does not present the usual frenetic cheery energy associated with the holiday. Instead it is quiet and lovely, joyous and melancholy, celebrating a remarkable event when soldiers put down their weapons and shared the spirit of peace across enemy lines for one brief and beautiful moment. Created by Peter Rothstein and presented annually byTheater Latte Da and Hennepin Theatre Trust, All is Calm tells the story of the 1914 Christmas Truce during the first year of WWI, in which soldiers along both sides of the trenches on the Western Front stopped fighting and met in no man's land to exchange photos and stories, bury the dead, play football, and sing carols. This story is told simply on a bare stage with only some wooden platforms and crates as set pieces, with three actors bringing to life the words from actual letters, articles, and other historical documents, illuminated by songs performed by the marvelous nine-man a capella vocal ensemble Cantus. It's a perfect marriage of music and storytelling, not the story of specific people or characters, but rather the story of peace in the midst of war. What better representation of the spirit of the season? Al Is Calm: The Christmas Truce of 1914 is enjoying its sixth anniversary (and six performances only) from December 19-22, 2013 at the Pantages Theatre. Featuring Cantus, an accomplished vocal ensemble along with three actors, Theater Latte Da’s artistic director Peter Rothstein artfully recalls the historic foot soldier-created truce between WWI’s Allied and German forces over Christmas 1914. Although an astounding moment in history, few of us were schooled in details about the truce. Rothstein’s inspired development of this production took five years, visits to the Western Front, and extensive research in Brussels, Ieper, Paris and London. This approx. 90-minute, no-intermission production tells the story of how active-duty soldiers working, literally sometimes just feet from each other, decide to lay down arms for at least one night (and in some locations, a few nights). Artfully presented, the production begins with a Christmas carol prelude by Cantus. English composer Ralph Vaughan Williams created this particular arrangement for his own battalion. Throughout the performance, Cantus members hauntingly, heartily and authentically sing in the various languages of the troops or accents of the soldiers. The remarkable vocals gave me equal amounts of goose bumps and tears throughout the performance (a nod to musical arrangements by Erick Lichte and Timothy C. Takach). The staging is simple: a riser created with logs, crates for sitting, a pin light curtain, a full moon and graceful moments of falling snow or eerie fog. Perhaps it’s this minimalism and the black and grey costuming that unites the actors with the chorus members seamlessly. It also creates the illusion audience that we are indeed in the trenches. The production and theater provides the audience with a helpful, detailed program that shares pictures, short bios, and other relevant information about the truce itself. Of particular interest are the four soldier poets of World War I that are introduced. It allows the audience to bring the story back home and extend the experience of learning about a poignant part of world history. As a singular performance, this was moving and heartfelt. As a Christmas tradition, it provides opportunity for intergenerational conversation. My guest this evening was a woman whose grandfather served in World War I. She was struck by the beautiful sound of Cantus, but also remarked about the dignity this production offered the individual soldiers. All too often, it seems, that we the public are presented with vague information about fallen, or even active duty soldiers. A particular pet peave of mine is when an individual soldier is referred to as a “troop.” It is sons and daughters, fathers and mothers who are killed in war, not a troop. It is my opinion that individual stories deserve recognition just as they are presented in this production. Well done, Mr. Rothstein! Note: TPT's "MN O: Minnesota Original" airs "The Making of Peter Rothstein's 'All Is Calm'" on occasion. All Is Calm: The Christmas Truce of 1914 opens next week, playing tonight, December 19-22, 2013 at the Pantages Theatre, 710 Hennepin Avenue, Minneapolis, MN. All Is Calm: The Christmas Truce of 1914 by Peter Rothsteinfeatures music arrangements by Erick Lichte and Timothy C. Takach and will be directed by Peter Rothstein. A co-production of Cantus, Theater Latté Da and Hennepin Theatre Trust. The Western Front, Christmas, 1914. Out of the violence comes a silence, then a song. A German soldier steps into No Man's Land singing "Stille Nacht." Thus begins an extraordinary night of camaraderie, music, peace. A remarkable true story, told in the words of the men who lived it. All Is Calm relives the story of an astounding moment in history when Allied and German soldiers laid down their arms to celebrate the holiday together by trading carols, sharing food and drink, playing soccer and burying each others' dead. In some places the truce lasted only a night, in others until New Year's Day. This dramatic re-telling contains actual quotes and letters from thirty World War I figures brought to life by actors Matt Rein, David Roberts and Alan Sorenson. Cantus beautifully weaves a tapestry of sound, drawing from patriotic tunes, trench songs, medieVal Scottish ballads and holiday carols from England, Wales, France and Germany which take on new depths when set in the context of trench warfare. Music, an important part of life in the trenches, helped create a context that inspired the truce. Thursday, 7:30 p.m. Friday, 7:30 p.m. Saturday, 2:00 p.m. & 7:30 p.m. Sunday, 1:00 p.m. & 6:30 p.m.
(Minneapolis/St. Paul) — Theater Latté Da announced today that a season of four adventures in musical storytelling and the continuation of a major new work development program will comprise its 16th Season. Slated for production are Steerage Song at The Lab Theater (September 25 – October 20, 2013), All Is Calm: The Christmas Truce of 1914 at the Pantages Theatre (December 19-22, 2013), Cabaret at the Pantages Theatre (January 15 – February 9, 2014), and Our Town at The Lab Theater (March 12 – April 6, 2014). In spring 2014, the company will bring back NEXT: New Musicals in the Making, their program to develop new works for the musical theater canon. In keeping with Theater Latté Da’s mission to explore and expand the art of musical theater and to tell stories that resonate with our current world, the company will open their sixteenth season with Steerage Song at The Lab Theater September 25 – October 20, 2013. Steerage Song premiered in concert form at the Fitzgerald Theater in 2011. Creators Peter Rothstein and Dan Chouinard have continued to develop the docu-musical, blending the songs of 20 countries of Old Europe and the rhythms of Tin Pan Alley into a moving, fully-staged, new musical. The production will be directed by Theater Latté Da Artistic Director Peter Rothstein with musical direction by Dan Chouinard and choreography by Linda Talcott Lee. The cast features Bradley Greenwald, Dennis Curley, Sasha Andreev and Jennifer Grimm among others. Back by popular demand, Theater Latté Da will once again join forces with Hennepin Theatre Trust and the renowned vocal ensemble Cantus to present All Is Calm: The Christmas Truce of 1914. In 2007 Rothstein created what has become a holiday classic by melding European carols and war songs together with found text to tell the remarkable story of the World War I Christmas Truce. All Is Calm premiered on Minnesota Public Radio to great success, and has since been broadcast around the globe through American Public Media and the European Broadcasting Union. All Is Calm will tour the country later this year ending with a performance at the Kennedy Center in Washington D.C. and six performances at the historic Pantages Theatre in downtown Minneapolis, December 19-22, 2013. Theater Latté Da returns to the Pantages Theatre January 15 – February 9, 2014, Cabaret, the provocative, Tony Award-winning musical by John Kander and Fred Ebb. With book by Joe Masteroff, based on the play by John Van Druten and stories by Christopher Isherwood, Cabaret is the second installment of Broadway Re-Imagined, a dynamic partnership between Theater Latté Da and Hennepin Theatre Trust. It comes on the heels of partnership’s hit production of Elton John and Tim Rice’s Aida. One of the greatest Broadway musicals of all time, Cabaret will be directed by Peter Rothstein, with musical direction by Denise Prosek and choreography by Michael Matthew Ferrell. The cast features Tyler Michaels as the Emcee. Michaels appeared as Melchior in Theater Latté Da’s 2012 Ivey Award-winning production of Spring Awakening, presented in partnership with the University of Minnesota Department of Theatre Arts and Dance. March 12 – April 6, 2014, Theater Latté Da returns to The Lab Theater for a compelling production of the great American play Our Town. For 75 years Thornton Wilder’s play has played a profound role in American culture. Theater Latté Da will honor the play’s 75th anniversary with a unique production, which infuses this Thornton Wilder classic with live music. A multi-cultural cast of actor musicians become the citizens of Grover’s Corners in this exciting new concept directed by Rothstein with musical direction Denise Prosek. Theater Latté Da will cap its 2013-14 Season with the return of NEXT: New Musicals in the Making during the spring of 2014. NEXT engages Twin Cities audiences in the creative process as Theater Latté Da supports the development of new works for the musical theater canon. This past season, audiences were treated to When the Moon Hits Your Eye by Pulitzer Prize-nominated Jon Marans, C. by local actor and playwright Bradley Greenwald and Tony Award-nominated Robert Elhai, and an expansion of Bessie’s Birthday by emerging artists Katie Baldwin Eng and Jeff Tang. Works to be developed in 2014 will be announced at a later date. SEASON TICKETS Theater Latté Da will again offer season ticket packages. For information or to request a season brochure, call 612-339-3003. ABOUT HENNEPIN THEATRE TRUST Hennepin Theatre Trust, owner of the historic Orpheum, State, Pantages and New Century Theatres, is an independent, non-profit organization dedicated to arts-inspired community cultural development. They achieve their mission by presenting a rich mix of live performances, creating inspiring arts education experiences and advancing a thriving Hennepin Avenue cultural district in downtown Minneapolis, Minnesota. The Trust’s activities include presenting Broadway touring productions and the related Broadway Confidential series, concerts, comedy, speakers and other variety entertainment plus educational initiatives including the SpotLight Musical Theatre and SpotLight Critical Reviewer programs for high schools, Teen Ushers, the Access Program and Family Day events. ABOUT CANTUS Cantus is known worldwide for its trademark warmth and blend and its engaging performances of music ranging from the Renaissance to the 21st Century. The Washington Post has hailed the ensemble’s sound as having both “exalting finesse” and “expressive power” and refers to the “spontaneous grace” of its music making. As one of the country’s only two full-time vocal ensembles, Cantus has grown to prominence with its distinctive approach to creating music. Working without a conductor, the members of Cantus rehearse and perform as chamber musicians, each contributing to the entirety of the artistic process. Cantus has released 15 albums on its own self-titled label, each to considerable acclaim. Of That Eternal Day (2010) The New York Times said, “the Cantus recording offers many satisfactions, none greater than a touching, ineffably simple performance of “The 23rd Psalm (dedicated to my mother)” by Bobby McFerrin.” The latest Cantus recording, On the Shoulders of Giants, was released in October 2012. December 19-22, 2013 Thursday and Friday, 7:30 p.m. Saturday, 2:00 & 7:30 p.m. Sunday, 1:00 & 6:30 p.m. Opening Night: December 19 ASL/AD: December 22, 2:00 p.m. Post-show Discussions: December 20, 7:30 p.m. & December 21, 2:00 p.m.
NEXT: New Musicals in the Making Spring 2014 Titles and specific dates to be announced at a later date. For more information or to purchase season subscriptions, please call 612-339-3003 or visit www.LatteDa.org. (Minneapolis/St. Paul) — Theater Latté Da announced the cast for Bessie’s Birthday, book and lyrics by Katie Baldwin Eng, music by Jeff Tang. This musical comedy is being developed as part of NEXT: New Musicals in the Making, a major new work program to develop new musical theater in the Twin Cities. Bessie’s Birthday features Caroline Innerbichler as Bessie, Elizabeth Griffith as Delphine, Janet Hanson as May, John Gamoke as Jack, Julie Madden as Grace, James Detmar as Sam, and Sasha Andreev as Max. Public readings of Bessie’s Birthday will take place April 26-28 at The Lab Theater in the Minneapolis Warehouse District. This hilarious and insightful new musical, Bessie’s Birthday, is set in rural Wisconsin and reunites a family for its annual celebration of Bessie’s birthday. Although Bessie is turning 30, she suffered a seizure as a child that has left her perpetually six years old, or so they think. But this year’s party is different; Bessie is on the cusp of change, ready to take the plunge. In the end, everyone is indeed changed as they all leap into the family pool. NEXT will provide Twin Cities’ audiences the opportunity to get in on the ground floor of the creative process and witness new musicals in the making. Peter Rothstein, Theater Latté Da Artistic Director, sits on the board of directors of the National Alliance for Musical Theatre and has been highly involved in their festival of new musicals. NEXT enters Theater Latté Da into this national arena and fulfills the organization’s commitment to the next generation of the American Musical Theater. April 26-28, 2013 Friday – Saturday, 7:30 p.m. Sunday, 2:00 p.m. The musicals being presented as part of NEXT are works in progress and not fully-realized productions. As such, reviewer tickets will not be available. For more information, please call 612-339-3003 or visit www.LatteDa.org. (Minneapolis/St. Paul) — Theater Latté Da announced today the cast for C., book and lyrics by Bradley Greenwald, music by Robert Elhai. This musical adaptation of the play Cyrano de Bergerac by Edmond Rostand is being developed as part of NEXT: New Musicals in the Making, a major new work program to develop new musical theater in the Twin Cities. C. features Bradley Greenwald as Cyrano. The talented cast also includes Laurel Armstrong, Lauren Asheim, Patrick Bailey, Sean Dooley, Elizabeth Griffith, Josiah Gulden, Reid Harmsen, Eric Heimsoth, Kim Kivens, John Middleton, David Roberts, and Max Wojtanowicz. Public readings of C. will take place April 19-21 at The Lab Theater in the Minneapolis Warehouse District. C. will be the second work presented at NEXT. Greenwald is one of the Twin Cities most cherished performers and was a key writer in the opera work of Theatre de la Jeune Lune. Elhai is a prolific film composer and orchestrator based in the Twin Cities. He was nominated for a Tony and a Drama Desk award for his orchestrations for The Lion King on Broadway. April 12-28, 2013 Fridays – Saturdays, 7:30 p.m. Sundays, 2:00 p.m.
Three New Shows to Launch the Company’s Major New Work Development Program (Minneapolis/St. Paul) — Theater Latté Da announced today the line-up for the inaugural year of NEXT: New Musicals in the Making, a major new work program to develop new musical theater in the Twin Cities. NEXT opens with When the Moon Hits Your Eye, running April 12-14, followed by C., running April 19-21, and closes with Bessie’s Birthday, running April 26-28, all performed at The Lab Theater in the Minneapolis Warehouse District. When the Moon Hits Your Eye, by Jon Marans, is a multi-ethnic play with music set in an old tenement walk-up in Hell’s Kitchen, New York City. The drama/comedy, tells the story of a widowed Italian barber, who finally wants to marry the true love of his life – Felizbela Carvalho – his mistress for the past twenty-five years. However, the course of true love never runs smoothly. The barber, his mistress and the other five off-beat lovebirds in this play find themselves consumed with the churning, inner turmoil of passion. C., book and lyrics by Bradley Greenwald, music by Robert Elhai, will be the second work presented at NEXT. C. is a musical adaptation of the play Cyrano de Bergerac by Edmond Rostand. Greenwald is one of the Twin Cities most cherished performers and was a key writer in the opera work of Theatre de la Jeune Lune. Elhai is a prolific film composer and orchestrator based in the Twin Cities. He was nominated for a Tony and a Drama Desk award for his orchestrations for The Lion King on Broadway. The final installment of this season’s NEXT is Bessie’s Birthday, book and lyrics by Katie Baldwin Eng, music by Jeff Tang. Set in rural Wisconsin, the musical reunites a family for its annual celebration of Bessie’s birthday. Although Bessie is turning 30, she suffered a seizure while swimming in their family pool that has left her perpetually six years old, or so they think. But this year’s party is different; Bessie is on the cusp of change, ready to take the plunge. In the end, everyone is indeed changed as they all leap into the pool. 3-Show passes are available for $25. Single tickets are $14. December 1, 2012. The National Endowment for the Arts announced last week that 31 arts organizations in Minnesota, including Theater Latté Da, will receive a total of $877,500 as part of the NEA's Art Works grants. Theater Latté Da will use their $10,000 grant to support the development of Bessie's Birthday, a new musical by composer Jeff Tang and lyricist/librettist Katie Baldwin Eng. Directed by Peter Rothstein, the piece tells the story of a family gathering to celebrate the 30th birthday of a daughter with a mental disability. Theater Latté Da patrons may recognize Bessie's Birthday as part of the triptych of new musicals Passage of Dreams, which premiered in 2009 at the Southern Theater. Theater Latté Da will work with Tang and Baldwin Eng again to expand Bessie's Birthday into a full-length, stand alone musical. The NEA will award 832 grants totaling $23.3 million through its Art Works funding category. Not-for-profit arts organizations in 47 states plus the District of Columbia and Puerto Rico will receive funding. The supported projects span 13 artistic disciplines and fields and focus primarily on the creation of work and presentation of both new and existing works for the benefit of American audiences. "Through a rigorous peer-review panel process, the NEA ensures that projects recommended for funding are among the most creative, the most effective, and will make a real impact," said NEA Chairman Rocco Landesman. "I am proud to announce these 832 Art Works grants and 40 Creative Writing Fellowships and I look forward to seeing the projects come to fruition for the benefit of both the grantees and their communities across the country." MINNEAPOLIS— Hennepin Theatre Trust and Theater Latté Da announced today the launch of Broadway Re-Imagined, a new collaborative partnership taking a fresh look at Broadway and other musical theatre productions. The series kicks off in January 2013 with a co-production of Elton John and Tim Rice’s Aida, imaginatively directed by Latté Da’s acclaimed artistic director Peter Rothstein, at the historic Pantages Theatre, 710 Hennepin Avenue, Minneapolis. Single tickets for Aida will go on sale through Hennepin Theatre Trust and Theater Latté Da at 10 a.m. on Friday, Oct. 12, 2012. Performances will run Thursday–Sunday, January 3–27, 2013. Aida has also been on sale as part of Theater Latté Da’s season subscriptions and as part of the Trust’s Flex Ticket Packages. Additional information is available at latteda.org and at HennepinTheatreTrust.org. Elton John and Tim Rice's Aida is based on a timeless love story drawn from the Giuseppi Verdi opera. It was made into a modern, Tony winning Broadway musical by Walt Disney Theatrical productions with music by Elton John, lyrics by Tim Rice and book by Linda Woolverton, Robert Falls and David Henry Hwang. As part of this new collaboration, the two organizations anticipate co-producing at least one show annually. The impetus for Broadway Re-Imagined builds from Theater Latté Da and Hennepin Theatre Trust’s successful work together since 2008 on All Is Calm: The Christmas Truce of 1914, co-presented with Cantus and running this year December 19–22 at the historic Pantages Theatre.Broadway Re-Imagined also expands the Trust’s continuum of work with such Minnesota talent as Wendy Knox and Frank Theatre, and the local productions of 2 Sugars, Room for Cream, Girls Only: The Secret Comedy of Women and Standing on Ceremony, all featuring Twin Cities casting and presented at the Trust’s New Century Theatre. Elton John and Tim Rice's Aida the musical originated from a children's storybook version of Verdi's opera written by the soprano Leontyne Price. The tale unfolds in the Egyptian wing of a modern museum, when a man and a woman catch each other's eyes and are magically transported to ancient Egypt. Thus begins a dramatic love story between Radames, the captain of the Egyptian army, and Aida, the captured Nubian princess. The source material was developed by Disney into the stage version which premiered on Broadway during March 2000, running for 1,852 performances until September 2004. It became the 34th longest running Broadway musical, with two U.S. national tours from 2002–2003 and from 2006-2007. Aida won four Tony Awards in 2000, including Best Musical Score and Best Performance by a Leading Actress. The cast recording also won the Grammy Award for Best Musical Show Album and “Written in the Stars” (recorded and sung by Elton John and LeAnn Rimes) reached No.2 in the Billboard U.S. charts and No.1 in the Canadian contemporary charts.Aida was also named by Time Magazine in 2000 as one of the top ten theatre productions of the year. Hennepin Theatre Trust, non-profit owner of the historic Orpheum, State, Pantages and the newly developed New Century Theatres, is dedicated to enriching the vibrant cultural atmosphere of the Twin Cities. We present a rich array of live performances, create inspiring arts education experiences and advance a thriving cultural destination in downtown Minneapolis. Our programs include Broadway touring productions, the Broadway Confidential series, our SpotLight Musical Theatre Program for high schools, the Critical View student reviewer program, the free ticket Access Program and Kids’ Night and leading the planning for a cultural district that will extend from the Minneapolis Sculpture Garden to the Mississippi Riverfront. Theater Latté Da is a Twin Cities musical theater company recognized for its ability to connect artists, audiences and communities through diverse stories that are both entertaining and enlightening. The company seeks to create new connections between story, music, artists and audience by exploring and expanding the art of musical theater. (Minneapolis/St. Paul) — Theater Latté Da announced today that a season of four adventurous musicals and the launch of a major new work development program will comprise its 15th Anniversary Season. Slated for production are Company at the Ordway McKnight Theatre (October 25 – November 18, 2012), the holiday classic All Is Calm: The Christmas Truce of 1914 at the Pantages Theatre (December 19-22, 2012), Elton John and Tim Rice’s Aida, a co-production with Hennepin Theatre Trust at the Pantages Theatre (January 3-27, 2013), and The Light in the Piazza at the Ordway McKnight Theatre (March 14 – April 7, 2013). On April 12, 2013, the company will launch NEXT, a major new works program to develop new musical theater in the Twin Cities. Theater Latté Da opens their fifteenth anniversary season with the musical comedy Company at the Ordway McKnight Theatre October 25 – November 18, 2012. As Minnesota grapples with defining marriage, Latté Da presents Stephen Sondheim and George Furth’s insightful and hilarious examination of marriage in contemporary society. On the night of his 35th birthday, confirmed bachelor Bobby contemplates his unmarried state. Surrounded by “those good and crazy people, his married friends,” Bobby weighs the pros and cons of married life, leading to one of the most profound conclusions in the American Musical Theater. Company showcases Sondheim at his brilliant, witty best, including the songs Another Hundred People, Side by Side, The Ladies Who Lunch and Being Alive. The original Broadway production won six Tony Awards, including Best Musical, Best Score, Best Lyrics and Best Book. The production will be directed by Latté Da’s artistic director Peter Rothstein and will star Twin Cities’ favorite Dieter Bierbrauer in the role of Bobby. Bierbrauer starred in Theater Latté Da productions of Violet, Parade, Floyd Collins, and A Christmas Carole Petersen. Back by popular demand, Theater Latté Da will once again join forces with Hennepin Theatre Trust and the renowned vocal ensemble Cantus to present All Is Calm: The Christmas Truce of 1914. In 2007 Rothstein created what has become a holiday classic by melding European carols and war songs together with found text to tell the remarkable story of the World War I Christmas Truce. All Is Calm premiered on Minnesota Public Radio to great success, and has since been broadcast around the globe through American Public Media and the European Broadcast Union. All Is Calm will tour across the country ending with six performances at the historic Pantages Theatre in downtown Minneapolis, December 19-22, 2012. Theater Latté Da returns to the Pantages Theatre with a re-imagining of Elton John and Tim Rice’s Aida, January 3-27, 2013, a co-production with Hennepin Theatre Trust. With a book by Linda Woolverton, Robert Falls and David Henry Hwang (M. Butterfly, Yellow Face), Aida is a contemporary spin on Giuseppe Verdi's grand opera about love and hate, slavery and freedom, war and peace. Featuring one of the most compelling scores of the Broadway stage by the legendary Elton John (Billy Elliot, The Lion King) and Tim Rice (Evita, Joseph and the Amazing Technicolor Dream Coat), Aida won four Tony Awards and the Grammy for Best Musical Show Album. The production will be directed by Rothstein, choreographed by Michael Matthew Ferrell, and will feature Jared Oxborough as Captain Radames and Cat Brindisi as Princess Amneris. Oxborough appeared as Che in Theater Latté Da’s record-breaking production of Evita, and Brindisi appeared last season in Theater Latté Da’s productions of The 25th Annual Putnam County Spelling Bee and Spring Awakening. Theater Latté Da returns to the Ordway Center’s intimate McKnight Theatre for a production of The Light in the Piazza, book by Craig Lucas, music and lyrics by Adam Guettel (March 14 – April 7, 2013). Based on a novella by Elizabeth Spencer, this romantic tale revolves around Margaret Johnson, a wealthy Southern woman, and her curiously innocent daughter, Clara, who spend a summer together in Florence. When Clara falls in love with a young Italian man, Margaret is forced to reconsider not only Clara’s future, but her own deep seated hopes and regrets as well. The Light in the Piazza will be directed by Rothstein, with musical direction by Latté Da’s co-founder Denise Prosek. The Light in the Piazza won six Tony Awards in 2005 and is perhaps the most celebrated score of the past decade. Theater Latté Da will cap its 15th Anniversary Season by launching a major new works initiative NEXT. The inaugural season will feature three new musicals in various stages of development (April 12-28, 2013) at The Lab Theater in Minneapolis’ historic warehouse district. NEXT will provide Twin Cities audiences the opportunity to get in on the ground floor of the creative process and witness new musicals in the making. Rothstein sits on the board of directors of the National Alliance for Musical Theatre and has been highly involved in their festival of new musicals. NEXT enters Latté Da into this national arena and fulfills the organization’s commitment to the next generation of the American Musical Theater. Theater Latté Da will again offer season ticket packages. For information or to request a season brochure call 612-339-3003. (Minneapolis/St. Paul) – Theater Latté Da announced today they will produce Company, music and lyrics by Stephen Sondheim, book by George Furth, this fall at the Ordway McKnight Theatre. Company will preview October 25 and October 26, open on October 27, and run through November 18, 2012. As Minnesota grapples with defining marriage, Theater Latté Da presents Stephen Sondheim’s insightful and hilarious examination of marriage in contemporary society. On the night of his 35th birthday, confirmed bachelor Robert contemplates his unmarried state. Surrounded by "those good and crazy people, his married friends,” Robert weighs the pros and cons of married life, leading to one of the most profound conclusions in the American Theater. Company showcases Sondheim at his brilliant, witty best; songs including “Another Hundred People,” “Side by Side,” “The Ladies Who Lunch” and “Being Alive.” Company is the winner of 6 Tony Awards including Best Musical, Best Score, Best Lyrics and Best Book. Robert will be played by Dieter Bierbrauer. Dieter is currently starring in Chanhassen Dinner Theatre’s production of Xanadu. His Theater Latté Da credits include Violet, Parade, Floyd Collins, A Man of No Importance and A Christmas Carole Petersen. Tickets for Company are available starting at $19 and are on sale through the Ordway Center at www.Ordway.org or by calling 651-224-4222. Group discounts are also available through Theater Latté Da by contacting groups@latteda.org or 612-339-3003. Company is made possible in part by a grant provided by the Minnesota State Arts Board, through an appropriation by the Minnesota State Legislature from the Minnesota arts and cultural heritage fund with money from the vote of the people of Minnesota on November 4, 2008. 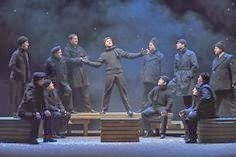 MINNEAPOLIS—All Is Calm: The Christmas Truce of 1914, the poignant production that has become a Twin Cities’ holiday classic and an annual theatre-going tradition, will return for six performances only Wednesday through Saturday, December 19–22, 2012 at the historic Pantages Theatre, 710 Hennepin Ave., Minneapolis. With words and songs drawn from the era, All Is Calm recalls the remarkable and spontaneous World War I truce between Allied and German forces in No Man's Land over Christmas 1914. This compelling ode to peace was created by Theater Latté Da’s acclaimed artistic director Peter Rothstein and features Cantus, one of America’s finest vocal ensembles, with musical arrangements by Erick Lichte and Timothy C. Takach. All Is Calm is a collaboration among Cantus, Theater Latté Da and Hennepin Theatre Trust. Tickets go on sale at 11 a.m., Friday, June 1. To purchase and for more information visit HennepinTheatreTrust.org. All Is Calm relives the story of an astounding moment in history when Allied and German soldiers laid down their arms to celebrate the holiday together by trading carols, sharing food and drink, playing soccer and burying each others’ dead. In some places the truce lasted only a night, in others until New Year’s Day. This dramatic re-telling contains actual quotes and letters from thirty World War I figures brought to life by actors Matt Rein, David Roberts and Alan Sorenson. Cantus beautifully weaves a tapestry of sound, drawing from patriotic tunes, trench songs, medieval Scottish ballads and holiday carols from England, Wales, France and Germany which take on new depths when set in the context of trench warfare. Music, an important part of life in the trenches, helped create a context that inspired the truce. All Is Calm opens with a set of carols arranged by English composer Ralph Vaughan Williams for his own battalion. The world premiere of All Is Calm was broadcast live on Classical Minnesota Public Radio and has since been heard around the globe through American Public Media and the European Broadcast Union. The program won the Gold World Medal at the 2010 New York Festivals and the 2010 Gabriel Award, which honors works of excellence in broadcasting that serve audiences through the positive, creative treatment of concerns to humankind. The original All Is Calm cast recording from this highly acclaimed collaboration between Cantus and Theater Latté Da is available for purchase on CD and as a download at cantussings.org. Tickets are on sale now and priced at $28 and $35.50 for adults; $25 and $15 for students (ages 6-18), seniors (age 62+) and military/veterans (with valid i.d.). Prices depend on seating preference and are subject to change. Additional fees may apply. Tickets may be purchased in person at the State Theatre Box Office (805 Hennepin Avenue, Minneapolis, 55402), online at HennepinTheatreTrust.org, through Ticketmaster by calling 800.982.2787 or by visiting a Ticketmaster Ticket Center. Groups of 10 are eligible for discounts and should call 612.373.5665 for information and reservations. Performances are held at the Pantages Theatre, 710 Hennepin Ave., Mpls., 55403. Performance dates and times: Wednesday, Dec. 19 through Saturday, Dec. 22, 2012 Wednesday, Dec. 19 at 7:30 p.m. Thursday, Dec. 20 at 11 a.m. and 7:30 p.m. Friday, Dec. 21 at 7:30 p.m. Saturday, Dec. 22 at 2 p.m. and 7:30 p.m.
Added Bonus! The Friday 7:30 p.m. and Saturday 2 p.m. performances include post-show “Talk Backs” with Peter Rothstein and members of the company. All audience members at these shows are invited to stay and participate. For more information on All Is Calm and other work by Cantus and Theater Latté Da please visit cantussings.org and latteda.org. HENNEPIN THEATRE TRUST, non-profit owner of the historic Orpheum, State, Pantages and the newly developed New Century Theatres, is dedicated to enriching the vibrant cultural atmosphere of the Twin Cities. We present a rich array of live performances, create inspiring arts education experiences and advance a thriving cultural destination in downtown Minneapolis. Our programs include Broadway touring productions, the Broadway Confidential series, our SpotLight Musical Theatre Program for high schools, the Critical View student reviewer program, the free ticket Access Program and Kids’ Night and participating in the planning for the cultural corridor that will extend from the Minneapolis Sculpture Garden to the Mississippi Riverfront.